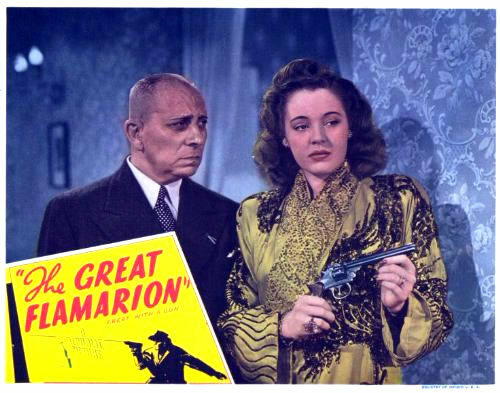 The Great Flamarion (1945), about a troubled sharpshooter (Erich von Stroheim, pictured above with costar Mary Beth Hughes) who becomes infatuated with a young dancer, is a superb early noir from legendary director Anthony Mann. The Great Flamarion begins with shots ringing out during a vaudeville performance in a Mexican theater. After a few moments of chaos, the body of a performer (Hughes) is found lying next to her drunken husband (Stephen Barclay). The police initially believe the man killed his wife until one of the performers finds a man (von Stroheim) dying from a gunshot wound who confesses to the crime and unravels a strange tale of lust, deceit, and revenge. The Great Flamarion, which is now available on the classic movie streaming site The Film Detective, makes fascinating viewing for old Hollywood fans, especially those who are interested in noir and Mann's career. The movie's plodding script is certainly a weak point. For my money, von Stroheim was actually right about the flashback structure not working; it detracts from the suspense of the film because too much is revealed in the first few minutes of the movie. 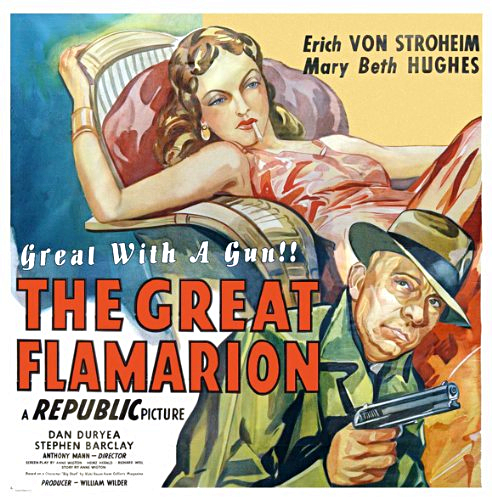 The Great Flamarion also has the typical B movie problems of a bad score and sparsely decorated sets, but it manages to overcome all of these flaws because of von Stroheim's star power and Mann's nimble direction. In fact, The Great Flamarion is the film in which Mann truly emerges as a great filmmaker. Previously, he had been a journeyman director of fairly average B movies for both RKO Pictures and Republic, but The Great Flamarion reveals his talent as a first-rate director of film noir. The movie's complicated plot unravels slowly, but Mann does an exquisite job of creating visual interest by using shadows and unusual camera angles. 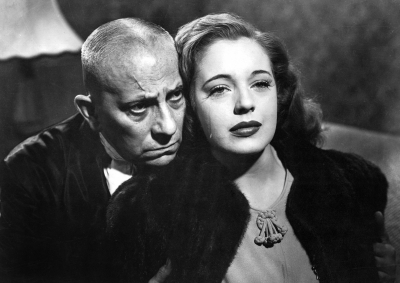 Erich von Stroheim and Mary Beth Hughes in a production still from The Great Flamarion (1945). The film hinges on two pivotal sharpshooting scenes with all three of the principal characters. These two scenes are essential to the movie's success and Mann stages them with a stylish, pinpoint precision that could have come straight out of an Alfred Hitchcock-directed thriller. The movie's exciting climax is one of Mann's great set-pieces in which he creates a sense of claustrophobia and dread out of von Stroheim's brooding face and artfully placed shadows. I'll leave you with this clip of the opening scene of The Great Flamarion and a great The New Yorker piece on the film. Go here to find out how to stream The Great Flamarion for free at The Film Detective. * The film is based on a short story by Grand Hotel author Vicki Baum called "The Big Shot," but it was substantially changed from page to screen to fit into a more noirish plot. "The Big Shot" was published in the Sept. 19, 1936 issue of Collier's magazine; you can read it by following this link. **Von Stroheim also appeared in French director Jean Renoir's masterpiece Grand Illusion (1937), as Field Marshal Erwin Rommel in Five Graves to Cairo (1943) and in the stage version of Arsenic and Old Lace. ***"He drove me mad," was Mann's terse assessment of working with von Stroheim.